It amazes me sometimes how many tricks and features my lovely Mac computer has that I remain blissfully unaware of. I only discovered Boot Camp (the utility that allows me to partition my hard drive and run either Windows XP or Vista on the second partition) after watching a Tech show on TV, and I know for a fact that I’m still not using a quarter of the features available to me in iPhoto. I had started out using Mac computers almost exclusively, but I then spent almost 15 years working in the clunky, non intuitive environment of PCs, and the learning curve of the Mac operating system had left me in the dust in the intervening years. Other than my graphics and web design software, the bundled program I use most on my Mac is definately iMovie. Faster and more fully featured that Windows Movie maker, it takes all of the guess work out of making small, simple web friendly movies – perfect for the dog hobbyist who, like me, has a video camera addiction. Over the weekend, I made a new movie of Solo, which I linked to in an earlier entry. Intrigued by the shutter delay feature on my XTI Rebel camera, I threw in some gratuitous stop motion still shots at the very end of the movie, and started toying with the idea of doing more time lapse videos. Hey, who doesn’t like seeing big chunks of time compressed into a single minute? The problem was, I had no intentions of standing in one place for an hour so I could take a billion photos, and I’m too impatient to take a single dog photo a day for the next ten years. I decided to go looking for hardware that would let me accomplish the same thing, and discovered that for just under a thousand dollars, I could get a camera remote with a timer. I then discovered that I could get a nifty piece of software that connects to my camera via USB and collects timed still images that can be knit into a movie. Perfect! But it only works on Windows. Another hour of googling, browsing, downloading and being disappointed, and I finally stumbled across Mac Docs link that pointed out that iMovie came with built in time lapse photography capture. Oops. I guess that’s why we’re supposed to read the manual. Anyways, I spent some time this afternoon capturing video of Solo, and of the bed area where my dogs spend most of their time. It’s in front our family room bookcases, and nicely close to the fireplace, so they sleep, roughhouse and stash toys there, making it a good place to shoot time lapse. You’ll find links to both videos below, and embeds after the cut. I also shot some new pix of Solo playing with Dexter. It’s so nice to see that he finally has a buddy to spend some time with, and Dexter is being so gentle with Solo that I’m well and truly impressed. 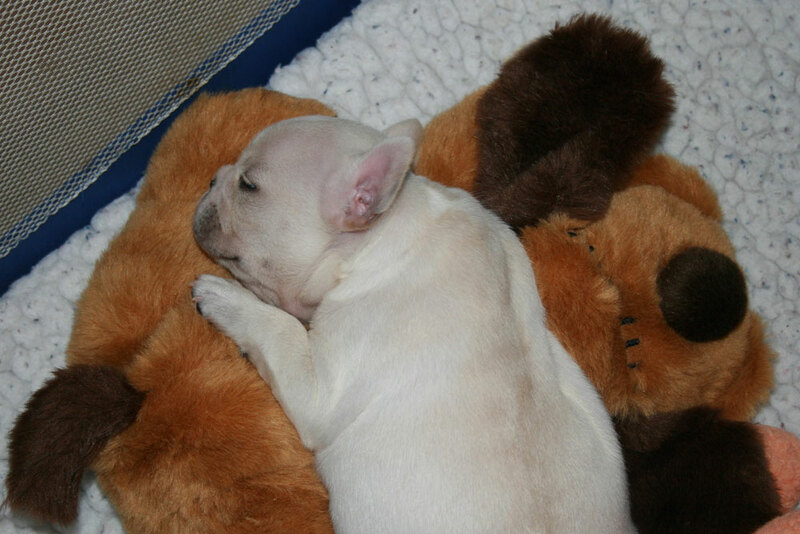 Solo has another new friend – his SnugglePuppie. Solo’s friend Judith sent it to him, because she is obviously powerless in the face of his ESPP. The SnugglePuppie has a heart beat, and can contain warming packets. You can even insert a bottle into it, and let the puppy nurse directly from the toy, in a way that more closely simulates natural nursing. We put Solo on his new best friend just after lunch, as soon as we’d unpacked the SnugglePuppie and set it up. He literally did not move from it for the next four hours. He’s usually a restless sleeper, but sleeping next to the warm, beating presence is obviously soothing. Thanks so much, Judith! Here are some pix of Solo and the SnugglePuppie, sleeping the sleep of the content. Embedded video after the cut. I love them. I’ve alerted the Oscar nominating committee.